And it's prettier than ever. You may not notice it at first, probably because the Mazda6 was , but the Japanese automaker’s flagship sedan has received a significant facelift for 2018. Making its official debut at the LA Auto Show, the 2018 Mazda6 features improved performance, general refinement, and, of course efficiency. Mazda has repeatedly stressed it’s upped the “premiumness” as opposed to using the word “luxury.” For example, there’s the new Signature trim which adds Nappa leather, wood trim and UltraSuede NU accents. But step inside and you’ll find a completely new interior, with the steering wheel and a few other minor pieces being the only carry overs. The front seats are also all-new, as they’re now wider with improved padding thanks to a higher-density foam. Ventilated seats, a first for Mazda, are also now available. Other new premium optional features include lots of tech bits such as a reconfigurable seven-inch instrument cluster, an eight-inch Mazda Connect infotainment screen, adaptive cruise control with stop-and-go capability, windshield-wiper de-icing, and a cool head-up display. Under its stunning skin, engineers have improved things for a better driving experience. For example, the steering rack has been directly mounted to the body for better driving feel. The suspension geometry has also been reworked and the overall ride has supposedly been made smoother with less outside noise. As for exterior styling, considering the Mazda6 was already a pretty thing, designers didn’t have to do much. They did, however, design a new grille with standard LED headlights on each side. There are also new 17- and 19-inch wheels designs and a new paint color, Sumptuous Soul Red Crystal, shown in the included photos. Under the hood is where the most relevant changes happen. You can now get a Mazda6 with a turbocharged engine, specifically the same 2.5-liter turbo four from the CX-9 crossover. It offers an . Opt for 93-octane fuel and there’s 250 hp and 227 ponies with 87. This engine is paired to a six-speed automatic transmission, but not the six-speed manual. If you prefer the latter, you’ll have to stick with the standard and naturally aspirated 2.5-liter four, which can be had with the auto as well. It too has been updated with improved efficiency thanks to the addition of cylinder deactivation. 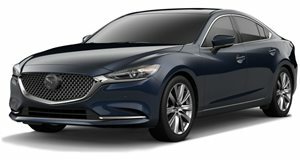 Mazda hasn’t released official pricing, but the 2018 Mazda6 is due to arrive in dealerships next spring.